The founder of scandal-hit Indian software company Satyam has been arrested two days after he admitted falsifying the firm's accounts. 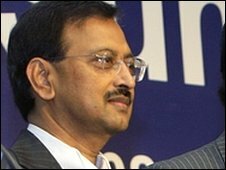 Ramalinga Raju, who stood down as Satyam's chairman on Wednesday, is charged with offences including criminal conspiracy and forgery. Mr Raju has already revealed that the firm had exaggerated its cash reserves by some $1bn (£661m). His arrest came after the government sacked the entire Satyam board. Mr Raju has also been charged with criminal breach of trust, cheating, and falsification of record. He was arrested together with his brother, former Satyam managing director B Rama Raju. The government said a new board would be appointed within 10 days. "The government is considering appointment of suitable persons as directors of Satyam," said Corporate Affairs Minister Prem Chand Gupta. "We are determined to reach the truth but are equally concerned with the fate of employees and other stakeholders." Satyam's shares fell to 11.50 rupees on Friday, their lowest level since March 1998. Last year they hit a high of 544 rupees. Some analysts say the future of the company is now in doubt.